Anti-death penalty activists hold a vigil outside the governor’s mansion in Little Rock, Arkansas, on April 20 in this photo shared on Facebook by the Arkansas Coalition to Abolish the Death Penalty. UPDATE: Arkansas executed death row inmate Kenneth Williams late April 27 after a prayer service hosted by Trinity Episcopal Cathedral. 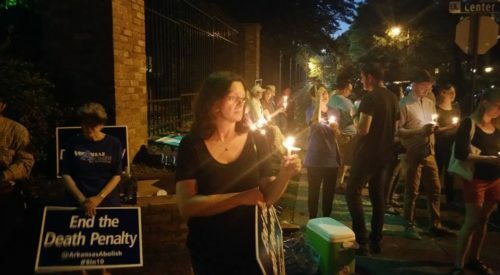 [Episcopal News Service] Episcopalians in Arkansas are preparing to gather once more for a prayer service on the eve of what is expected to be the final in a series of expedited executions by the state, which activists say could give momentum to efforts to abolish the death penalty. Arkansas is scheduled April 27 to execute convicted murder Kenneth Williams, 38, the fourth death row inmate to be executed in a week, as the state rushes to carry out the sentences before its stock of one of its lethal injection drugs expires. Before this month, Arkansas had not carried out an execution in nearly 12 years. As it did on the eves of the previous three executions, Trinity Episcopal Cathedral in Little Rock will hold a brief ecumenical service at 6 p.m. April 27 followed by a candlelight vigil that will culminate in the toll of bells. The service will offer prayers for Williams, for his victims and their families and for the corrections employees who will be carrying out the execution. “For all of these, and for ourselves, we will pray for hope, for strength and for mercy,” cathedral spokesman Josiah Wheeler told Episcopal News Service. The Episcopal Church has stood against the death penalty since it was reinstated by the Supreme Court in 1976, with several General Convention resolutions calling for the death penalty to be abolished, most recently in 2015. The death penalty still is in effect in 31 states, but the number of executions nationwide has dropped steadily since 1999, from a high of 98 that year to 20 in 2016, according to the Death Penalty Information Center. Arkansas has executed 30 inmates since 1976 but none since 2005, until this month. The state had planned to execute eight inmates in 10 days, starting on Easter Monday, but four of those executions have been halted by court order. 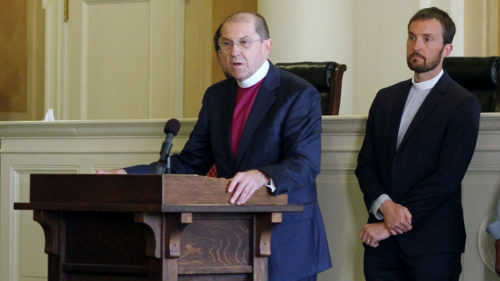 The Episcopal Diocese of Arkansas has been active in efforts to end capital punishment in the state, and Bishop Larry Benfield joined clergy from other denominations on April 12 in a rally at the Capitol to call on Gov. Asa Hutchinson to stop the executions. The Rev. Mary Janet “Bean” Murray, a retired deacon, and member of St. Michael’s Episcopal Church in Little Rock, said she and other anti-death penalty activists are disheartened that a fourth execution is expected to be carried out, but they already are looking beyond this week in stepping up their push for changing state law. She is vice president of a group called the Arkansas Coalition to Abolish the Death Penalty, which met this week to discuss its future strategy. “We will continue to work and work until the death penalty is no longer an issue,” Murray told ENS. Caroline Stevenson, another Episcopalian from Little Rock, said the recent executions may give people who favored the death penalty a reason to rethink their support. Four states have abolished the death penalty since 2009: New Mexico, Illinois, Connecticut and Maryland. Nebraska’s Legislature passed a law in 2015 eliminating capital punishment, but it was reinstated by popular vote in 2016. Public opinion has for decades tilted in favor of the death penalty, with a Gallup poll from 2016 showing 60 percent of respondents supporting a death sentence for someone convicted of murder. Support typically decreases when alternatives are suggested. When asked whether they would choose to sentence a murderer to death or to life in prison, 50 percent said they would choose the death penalty in a 2014 Gallup poll. The fight to abolish the death penalty may remain an uphill battle in pro-death penalty states like Arkansas, but Murray and other Episcopalians see killing of any kind as incompatible with what their Christian faith teaches. “When we say in our baptismal vows that we’ll respect the dignity of every human being, that includes criminals too,” Murray said. Do our vows reach the life in the.womb? That is not the issue at hand. I feel you are setting up a straw man to demean the issue at hand. Actually, all killing is wrong, so killing someone for killing someone is clearly wrong. The state has no right to kill, however common the practice has been since time immemorial. About that baby still in the womb: the issue here is to help women find ways to limit their fertility so that they are never in a situation where they cannot bear the child they are carrying. And, Donald, until the day comes when men are the ones who get pregnant, you don’t really get a vote!! Well…considering that men do help in the conception, he still has an opinion. But any form of ending life kills all of us in some way. And that includes unjust wars between nations as well. Peace. It is called a consistent peace and life ethic, to avoid violent solutions at all costs when adoption and life in prison are non-violent options…. It continues to amaze me that so many self-righteous liberals care more about the lives of murderers than they do about innocent babies in the womb. What strikes me about the article and the comments here is a total lack of sympathy for the families, friends, neighbors and communities of the victims, let along the victims themselves. Oh, the article mentions praying but, of course, mention the murderer first. I guess I am one of those crazy people who actually have compassion first and foremost for the victims of the heinous crimes. It sickens me to see all of the sanctimonious, self righteous Christians who utterly ignore the victims and their families so they can proclamation to the world their superior beliefs of reserving all of their compassion for the criminal. Should we minister to the criminal? Of course. But not one of the anti -death penalty folks even mentioned the victims.